The Great Blue Heron is One of the Most Recognizable Birds in Nature, Add One to Your Collection with This Silver Proof! While there are many stunning birds that can be found in Canada, the great blue heron is simply a unique creature. Its unique appearance is one of the reasons it is so widely admired by wildlife lovers. This Great Blue Heron Silver coin has a Matte Proof finish. It was issued as a part of the Celebrating Canada’s 150th series. This series highlights the variety of wildlife, culture, and landscapes that make Canada unique. 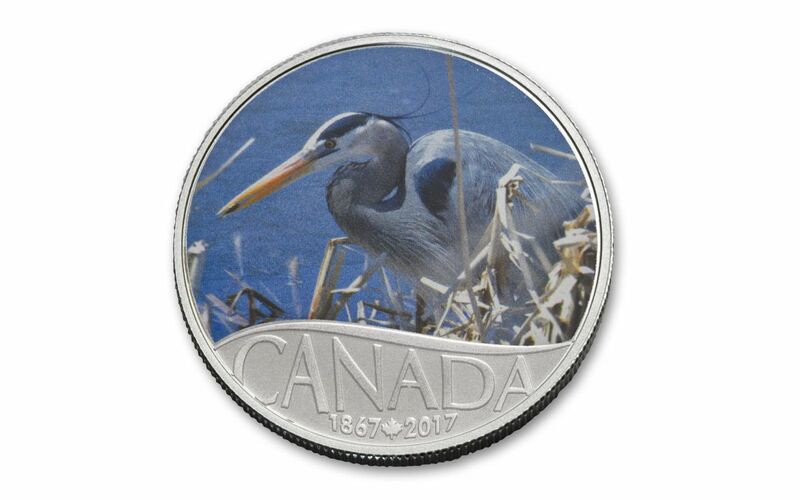 Celebrating Canada’s 150th– The Great Blue Heron is the 4th design of the Celebrating Canada’s 150th series. Due to the theme of the series, the designs showcase a variety of subjects. Mintage of each coin in the series is limited and there will be a total of 13 designs. Classic Image– The design on the reverse is based on a photograph of a great blue heron taken by Claude Belanger. This photo was featured in Canadian Geographic magazine. The design has been colorized to show the stunning level of detail captured in the picture. Struck by the Royal Canadian Mint– Like other Silver coins from the Royal Canadian Mint, this one is .9999 fine. This Matte Proof weighs ½ Troy oz. 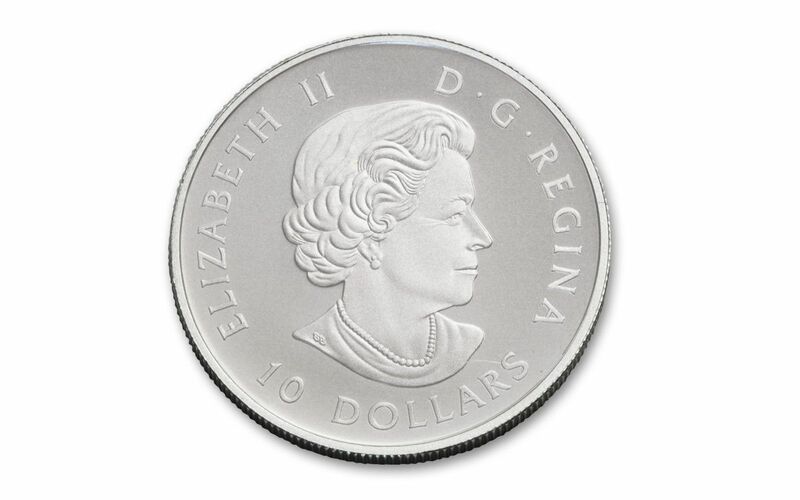 $10 Face Value– This coin can be used as legal tender in Canada, it has a face value of $10. Since it is a Canadian coin, the obverse features a portrait of Queen Elizabeth II. This portrait is the work of Susanna Blunt. Limited Production– Mintage of each coin in the Celebrating Canada’s 150th series is limited. 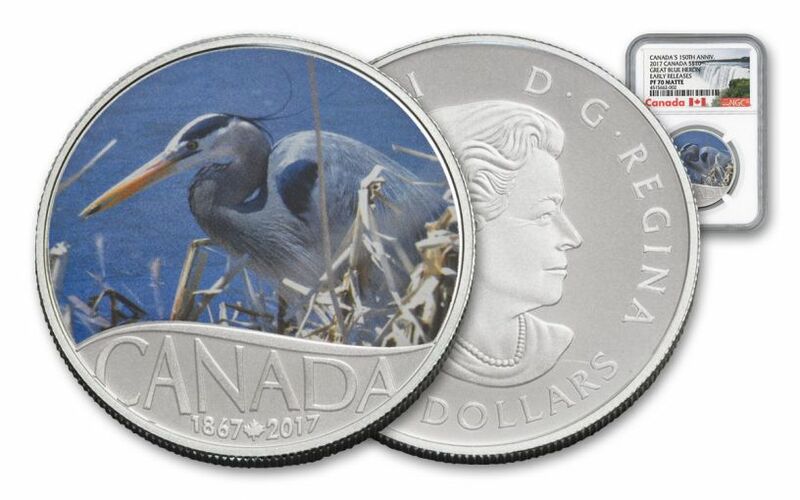 The mintage limit for the 2017 Great Blue Heron ½ oz. Silver Matte Proof is 25,000 pieces. Graded by NGC – This coin was certified by the Numismatic Guaranty Corporation. It received a perfect Proof 70 grade as well as the Early Releases designation. No more than 25,000 of these coins will be released by the Royal Canadian Mint. 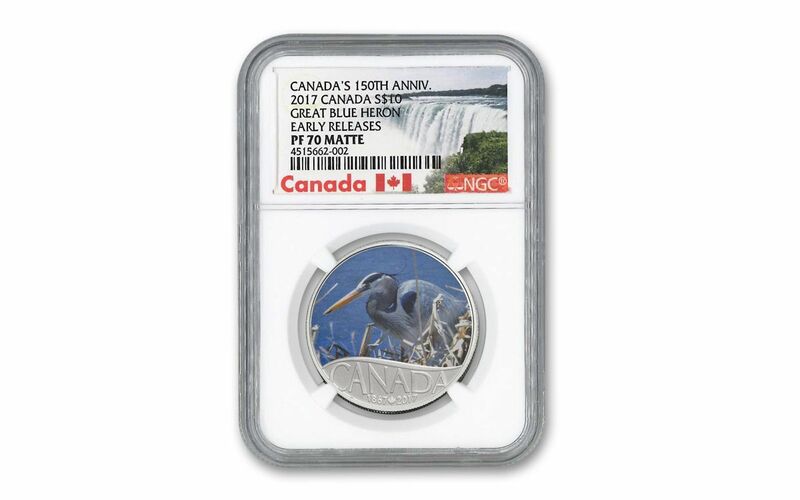 This NGC PF70 Early Releases 2017 Canada Great Blue Heron ½ oz. Matte Silver Proof could be a part of your collection, order from GovMint.com today!